The HTML view opens showing just the contents of the current note, but the tick boxes at the left of an HTML view window choose what other content may be included (and is show in the code section of the window). Exports the text in the selected note and potentially, based on settings its descendants—the notes it contains, the notes they contain, and so on. Child notes may either be exported separately and/or included as part of the current note's export. If the panel's settings are changed or a preview or export in invoked the views contents are automatically refreshed and updated before the code is processed. Export. 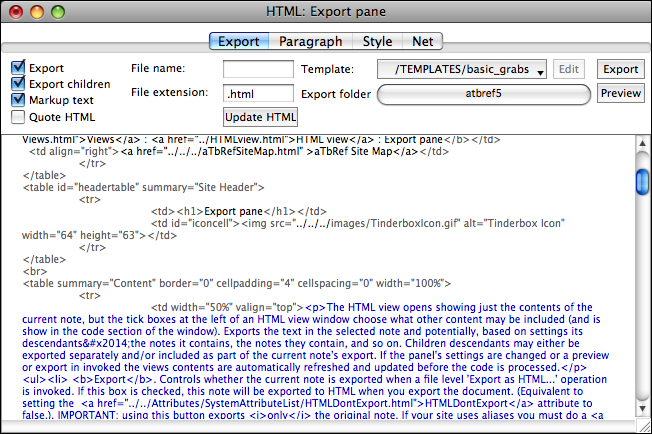 Controls whether the current note is exported when a file level 'Export as HTML…' operation is invoked. If this box is checked, this note will be exported to HTML when you export the document. Having this box ticked is equivalent to setting the $HTMLDontExport attribute to false. IMPORTANT: using this button exports only the original note. If your site uses aliases you must do a full HTML export to refresh that output. File extension. The suffix that should be added to the filename for the HTML file - default is normally '.html'. Setting a non-default value is equivalent to setting the $HTMLExportExtension attribute. Update HTML. Click this button to update the text shown in the code window to reflect any changes you have made to the options in this window. In general use there is no need to use this button as the view updates itself if the associated note is changed. However, this button is useful if refreshing content that uses includes and where the included notes have changed but the page holding the includes hasn't. template. The popup menu at the top centre of the window lets you choose which template should be used when exporting to HTML. Choose a file name from the pop-up menu, which lists all the text export template files in the text export templates folder, template notes and Tinderbox internal templates. The pop-up either shows the name of the selected template or "Choose template folder" indicating you have yet to choose a template. The value set is the equivalent to setting the $HTMLExportTemplate attribute. The HTMLExportTemplate attribute specifies which template goes with a note. If that attribute is blank, this default is used. export folder. Click this button to export the text of the note (or notes or entire document). After exporting, you can open this new text file with whatever word processor or other text application you choose. (You may need to check your application's instructions for opening or importing a plain text file.) Remember that no matter what note you are viewing when you make this choice, it applies to all HTML exports from the document. click the button, then use the standard file dialog to choose a folder. Edit. (This button is only available if the selected template is an external file. External template. Click this button to edit the external text file holding used for this note. The template file will open with whatever application you used to create it—a template created with BBEdit will open in BBEdit, etc. You can then modify the template, save your changes, return to Tinderbox, and click Update or Export, to see how your changes affect the text export. Internal templates. These should be edited by opening the relevant note in the current TBX. Export. Click this button to export the current note - and any included/child content (but not actual child notes) to HTML. Remember that exporting will overwrite any older HTML, JPEG, and PNG files of the same name(s). [output code window]. This shows the raw HTML code that will be output for the current note. The code font name and size are set via the Font and Size options on the Preferences HTML pane. Text in grey is that taken from the template(s). Black text is that inserted via parsing of export codes. The blue text represents the body of the note - which may contain includes via export codes in the note's body copy. Note that although the Export folder is a document level setting it can only be set via this view and not via the Preferences HTML pane. Characters already already entered in the text as HTML entities are detected and exported as expected. Tinderbox recognises macros embedded in text. If a paragraph contains only a macro, Tinderbox doesn't add paragraph mark-up to that paragraph — it assumes that the macro will do this. If you want Tinderbox to add paragraph mark-up, just add some space characters before or after the macro. Tinderbox recognises any paragraph that contains only export template expressions (notably ^include(…)^ and ^children(…)^ ). Tinderbox won't add paragraph mark-up to the result of these expressions. Again, adding space characters before or after the mark-up will cause Tinderbox to add paragraph mark-up. If an export code is on a line of its own before the end of the note, do ensure you add closing ^ or the output HTML may not be as you suspect. Tinderbox ships with the specimen templates stored internally within the application package. This means you can immediately access a few basic templates in a new TBX without having to manually set up a template folder as in the past. Of course, if you wish to use your own templates you will still need to set the template folder location manual before use.